Seen from Centerpoint tower, southeast lie suburbs from Kings Cross to Paddington, with sea beaches behind (Bondi, Bronte, Coogee…). The big white tower in the center is The horizon. 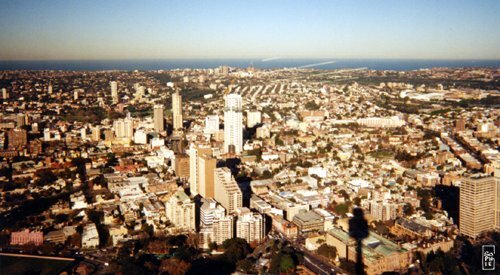 Vu de la tour Centerpoint, au sud–est on voit des quartiers comme Kings Cross ou Paddington, avec des plages donnant sur l’océan derrière (Bondi, Bronte, Coogee…). La grande tour blanche au centre est The horizon.